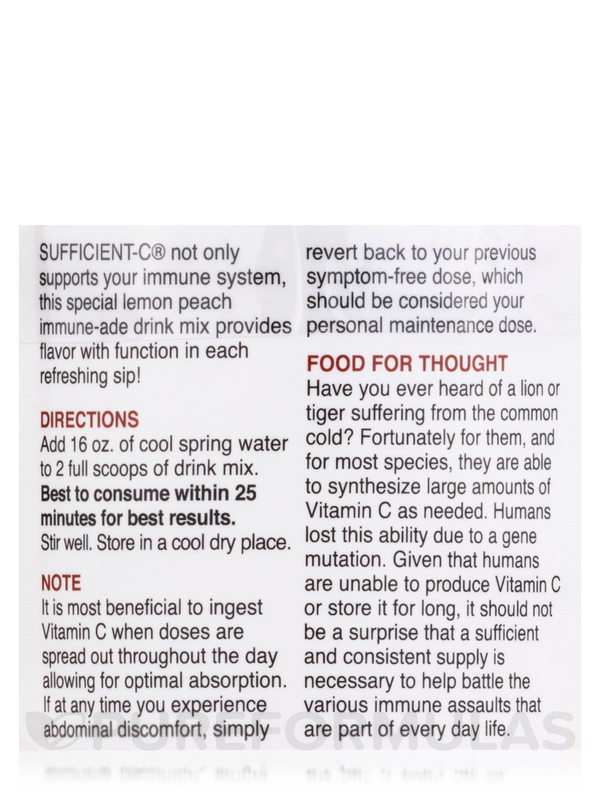 Bought High Dose Lemon Peach Immune-Ade Drink Mix by Sufficient-C after studying the BEST vitamin C sources per Dr. Suzanne Humphries on YouTube. I am not disappointed! A great tasting product and easy way to get Vitamin C (non GMO) into your diet . 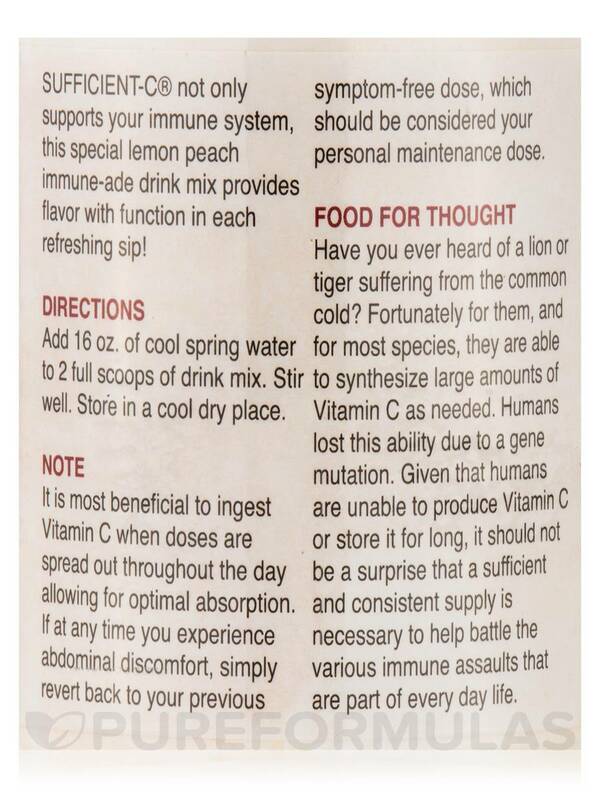 Sufficient-C® not only supports your immune system‚ this special lemon peach immune-ade drink mix provides flavor with function in each refreshing sip! Other Ingredients: Natural flavoring‚ acacia gum‚ stevia‚ rice full concentrate. 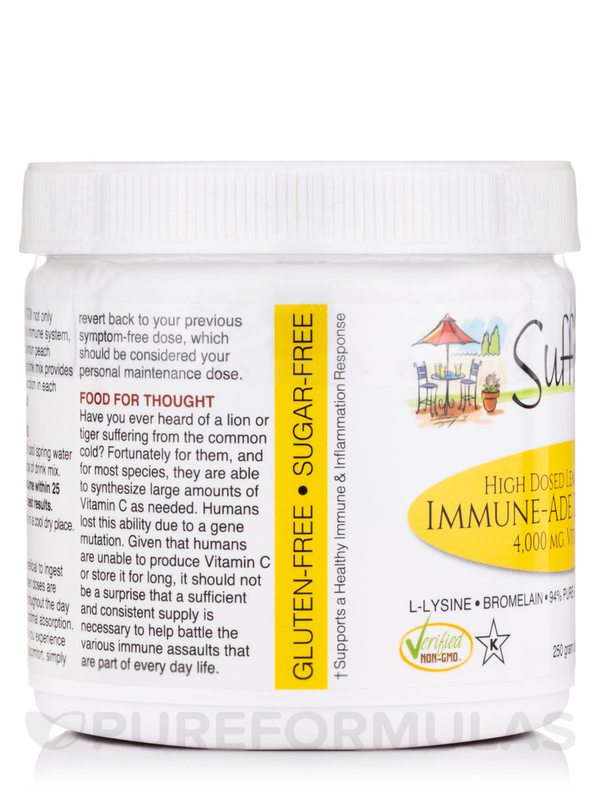 Non-GMO / Kosher / Caffeine-Free / GMP Certified / Gluten-Free / Sugar-Free. Add 16 oz. of cool spring water to 2 full scoops of drink mix. Stir well. Notice: It is most beneficial to ingest Vitamin C when doses are spread out throughout the day allowing for optimal absorption. If at any time you experience abdominal discomfort‚ simply revert back to your previous symptom-free dose‚ which should be considered your personal maintenance dose. 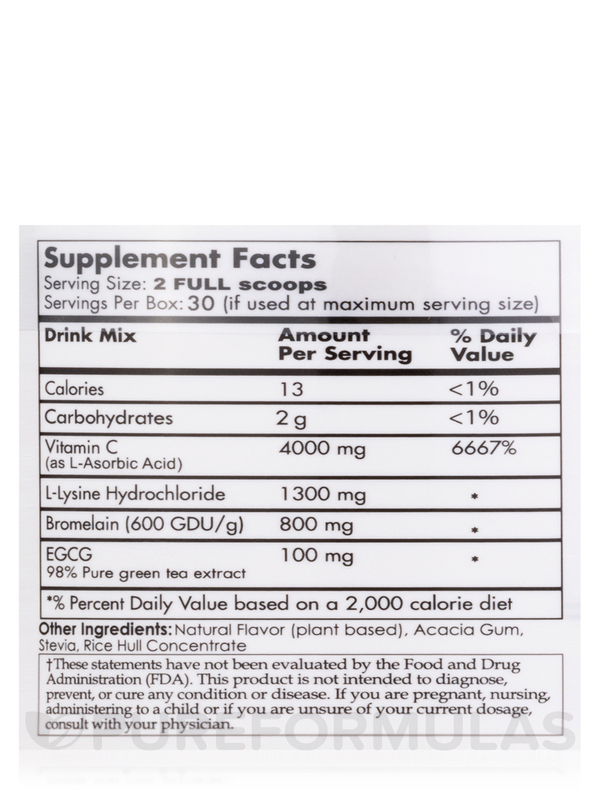 I like this Sufficient-C High Dose Lemon Peach Immune-Ade Drink Mix by Sufficient-C very much, however, since I do not consume sweets I find this somewhat sweet for me so I use about 1/4 the amount and add additional L ascorbic acid to bring up the vitamin c dose. I use it several times a day. 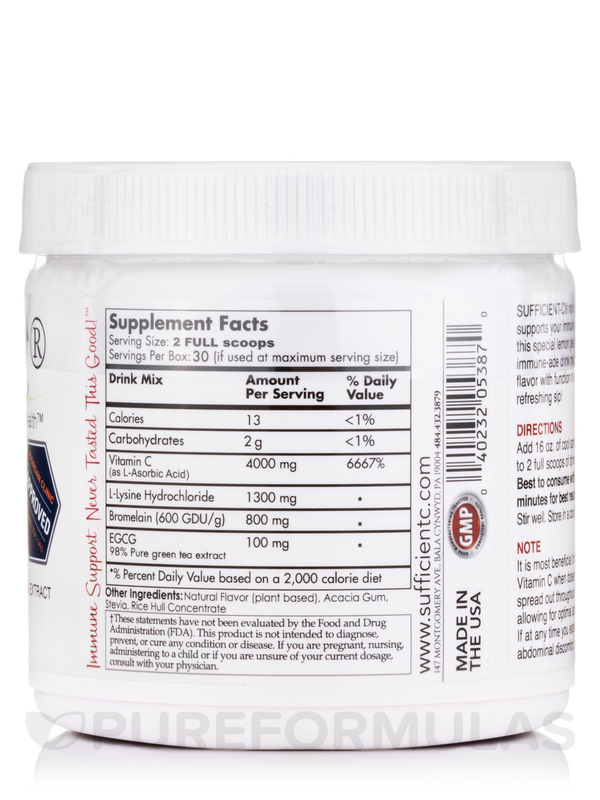 It has the added benefit of L-lysine, bromelain, and green tea extract. it has a very nice taste, no aftertaste or stomach discomfort. I am very happy about the quality of this product and feel very confident using it. I love how you can mix Sufficient-C High Dose Lemon Peach Immune-Ade Drink Mix by Sufficient-C to your own taste and not have to worry about sugar and by products! My kids love it, and I can always depend on it for healthy hydration. Best Vitamin C powder ever! 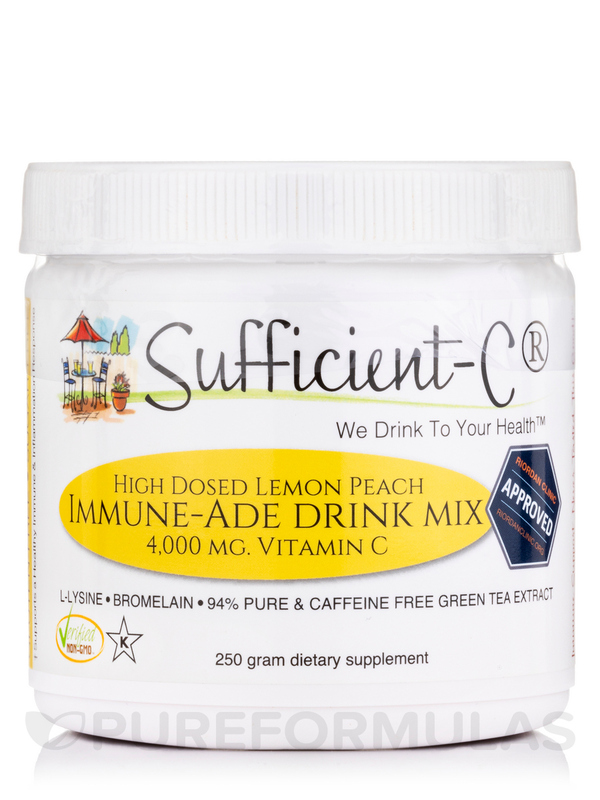 I love thisSufficient-C High Dose Lemon Peach Immune-Ade Drink Mix by Sufficient-C powder. I use it daily and it has a very good taste. I drink half my body weight in ounces daily and if by the end of the day I'm behind, if I add this powder to my last 16 oz or so it goes down so easily. Kids should love it cause the kid in me sure does!! 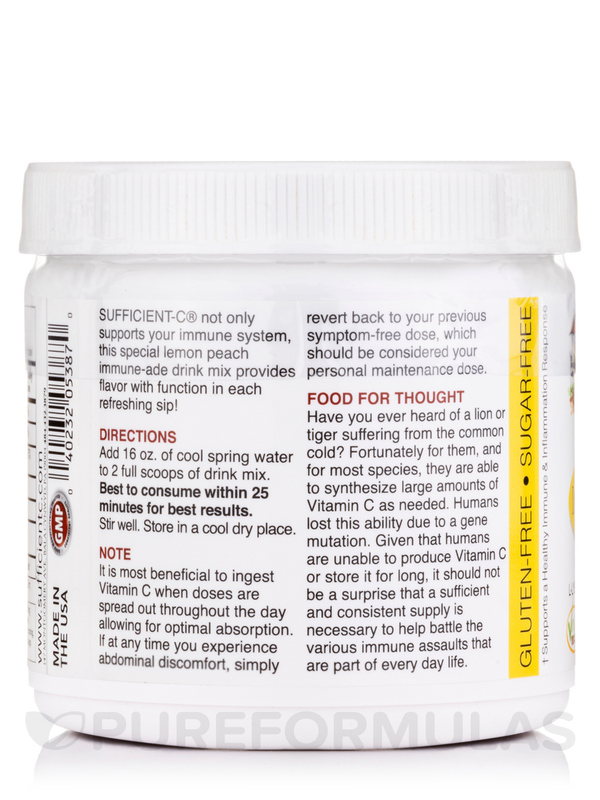 Powerful punch of yummy immune support!